The koala could soon be even more endangered than at present, if it turns out that climate change alters the nutritional value of the only food it can eat – Eucalypt leaves. Assistant Professor Elizabeth Neilson from the Department of Plant and Environmental Sciences from University of Copenhagen has received a 5 million grant from the Villum Young Investigator Program for the search of how the chemical structure of the leaves is disrupted. “We are going to investigate how two distinct results of climate change, drought and elevated CO2 levels, affect the balance between nutrient and toxicant content of the Eucalypt leaves and how this affects the Koala. Eucalypt leaves are highly toxic and the koala needs to sleep or rest for 20 hours a day to efficiently detoxify the poisonous components and gain sufficient energy from their diet. Therefore, the huge amount of energy spent on detoxification is only just about made up by the nutritional value. Any shift in the eucalypt chemistry caused by climate changes may alter the balance of nutritional value and toxicity, and impact koala survival,” says Assistant Professor Elizabeth Neilson. She and a group of colleagues founded the idea behind the project back in 2012 and she has been working in the lab and in the field almost ever since. 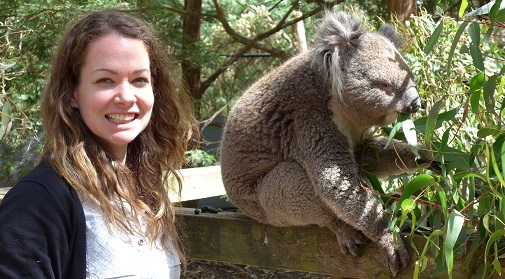 “Our collaborators in Australia have been investigating the microbial community in the koala’s gut and in the past years I have been working towards understanding the chemical complexity of eucalypt leaves and investigated how concentrations of specialized metabolites change through time. Over the next four years, the Villum grant allows me to build on this knowledge and address how the chemical balance of the leaves change in response to climate-related stress,” she explains. Elizabeth Neilson points out that the study into the fragile relationship between koala and eucalypt could prove to be a valuable example of how climate change potentially affect other animals. Accordingly, the research team hopes the project can help attract more attention to the threats posed by climate change to the animals and natural systems in general, not just to the koala. ”This study will shed light on how the effects of climate change may have a significant impact on an important ecosystem, and show how this can affect plant-animal interactions. If the effect of climate change and the resulting stress factors can be demonstrated for the koala, which is an international iconic species, it will serve to raise the awareness of the impact of climate change to the general public and politicians. Thus, this project will increase the priority of governments to improve environmental measures and legislation, and increase sustainable long-term management and protection of the environment,” says Elizabeth Neilson. The project “How does climate change impact plants and their herbivores? 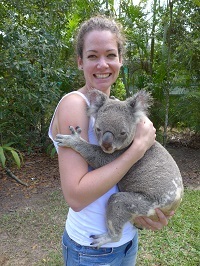 Eucalyptus and the Koala” have received a grant of 5 million Dkr from the Villum Young Investigator Program and Elizabeth Neilson along with a postdoc and two PhD students will spend the next four years working on it. The majority of the research will be carried out at the Department of Plant and Environmental Sciences at the University of Copenhagen and the findings will be validated in Sydney, Australia. Read more about the Villum Young Investigator Program here.